Os polinizadores e seu papel fundamental para a manutenção da biodiversidade e da produção agrícola têm sido o foco da atenção de cientistas e tomadores de decisão de modo mais intenso a partir da constatação de seu declínio em várias partes do globo, principalmente onde eram utilizados pelos serviços ambientais que prestam. Um histórico da questão, das decisões sobre uso e conservação dos polinizadores no mundo, de como as várias regiões do globo, representadas pelas Iniciativas de Polinizadores locais, responderam à Iniciativa Internacional dos Polinizadores, aprovada pela Convenção da Biodiversidade em 2000, é apresentado. Os resultados obtidos pelos estudos recentes tornaram o tema mais concreto e importante, e novos acontecimentos, como um agravamento da questão climática e a síndrome do desaparecimento das colônias de Apis mellifera, aliados a levantamentos concretos sobre a valoração econômica da agricultura, tornaram o tema mais impactante. Propomos aqui estratégias e ações para a conservação da biodiversidade, uso sustentado e serviços ambientais de polinizadores, utilizando para isso as análises realizadas por cada grupo de trabalho especializado em um dos temas apresentado como capítulo deste volume, que apontou os desafios a enfrentar, os pontos fortes, os pontos fracos, as oportunidades e as ameaças sobre o tema polinizadores. Com base nestes pontos apresentamos metas e um plano de ação para polinizadores. Pollinators have been the focus of attention of scientists and decision makers since their decline was observed in various parts of the globe, mainly in areas where their environmental services are used. A brief history about this, the decisions about the use and conservation of pollinators in the world and how various regions of the globe, represented by local Pollinators Initiatives are answering to the CBD’s International Pollinators Initiative approved in 2000. The results of recent studies made the theme more concrete and important and new factors such as climate change and the Colony Collapse Disorder (CCD) of Apis mellifera combined with specific studies on economic valuation of pollination services increased the importance of the theme. Strategies and actions proposed should generate more knowledge that will lead to new actions to guarantee the sustainable maintenance of environmental services of pollinators. In order to develop a strategy, the work presented by different specialized working groups was analyzed. This work is presented as chapters in this volume and each group presented the strengths, weaknesses, opportunities and threats concerning pollinators, specifically addressing their theme of interest. Based on these points the goals to be achieved and an action plan to reach these goals are presented. AIZEN M.A. ; GARIBALDI L.A.; CUNNINGHAM S.A.; KLEIN A.M. Long-term global trends in crop yield and production reveal no current pollination shortage but increasing pollinator dependency. Current Biololgy, v.18, p.1-4. 2008. AIZEN, M.; HARDER, L. The global stock of domesticated honey bees is growing slower than agricultural demand for pollination. Current Biology, v. 19, n. 11, p. 915-918, 2009. ALVES, D. A.; IMPERATRIZ-FONSECA, V. L.; FRANCOY, T. M.; SANTOS-FILHO, P. S.; BILLEN, J.; WENSELEERS, T. Successful maintenance of a stingless bee population despite a severe genetic bottleneck. Conservation Genetics, no prelo, DOI 10.1007/s10592-010-0171-z..
BIESMEIJER, J. C.et al. Parallel declines in pollinators and insect-pollinated plants in Britain and the Netherlands. Science, v. 313, p. 351-354, 2006. BUCHMANN, S.; NABHAN, G.; MIROCHA, P. The forgotten pollinators. Washington: Island Press, 1996. CAMERON, S. A.; LOZIER, J. D.; STRANGE, J. P.; KOCH, J. B.; CORDES, N.; SOLTER, L. F.; GRISWOLD, T. L. Patterns of widespread decline in North American bumble bees. Proceedings of the National Academy of Sciences, v. 108, n. 2, p. 662-667, 2011. CASTRO, M.S. ; KOEDAM, D.; CONTRERA, F.A.L. ; VENTURIERI, G.C. ; NATES-PARRA, G.;MALAGODI-BRAGA, K.S. ;CAMPOS, L.A.O. ; VIANA, M.; CORTOPASSI-LAURINO, M.;NOGUEIRA-NETO, P.; PERUQUETTI, R.C. IMPERATRIZ-FONSECA, VL. 2006. Stingless bees. In: IMPERATRIZ-FONSECA, VL; SARAIVA, A.M. & DE JONG, D. Eds. 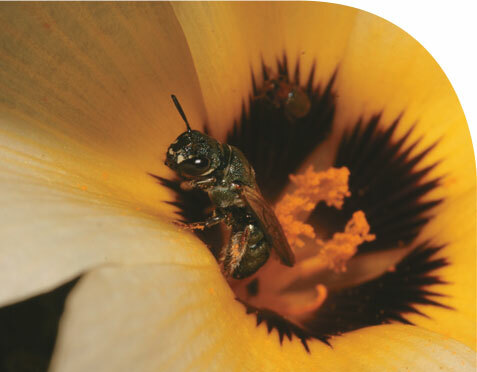 Bees as pollinators in Brazil: assessing the status and suggesting the best practices, Holos editora, Ribeirão Preto, p. 75-88. Costanza, R., d’Arge, R., Groot, R., Farber, S., Grasso, M., Hannon, B., Limburg, K., Naem, S., O’Neill, R.V., Paruelo, J., Raskin, R.G., Sutton, P., VandenBelt, M. The value of the world’s ecosystem services and natural capital. Nature v.387, p. 283–387, 1997. DAFNI , A.; KEVAN,P. ;GROSS, C.; GOKA, K. Bombus terrestris, pollinator, invasive and pest: an assessment of problems associated with its widespread introductions for commercial purposes. Applied Entomology and Zoology, v. 45, n.1, p. 101-113, 2010. DARVILL, B.; ELLIS, J. S.; LYE, G. C.; GOULSON, D. Population structure and inbreeding in a rare and declining bumblebee, Bombus muscorum (Hymenoptera: Apidae). Molecular Ecology, v. 15, n. 3, p. 601-611, 2006. DIAS, B.; RAW, A.; IMPERATRIZ-FONSECA, V. International pollinators initiative: The São Paulo declaration on pollinators. Brazilian Ministry of the Environmen. Brasília. 1999. FREE, J. B. Insect pollination of crops. London & New York: Academic Press, 1970. (Horticulture, Textbk, Pollination). GHAZOUL, J. Buzziness as usual? Questioning the global pollination crisis. Trends Ecol. Evolv.20, p. 367-373. 2005. GORG, C., Neßhöver, C & PAULSCH, A. A new link between biodiversity science and policy. Gaia, v. 19, n. 3, p. 183-186, 2010. GOULSON, D. Impacts of non-native bumblebees in Western Europe and North America, Applied Entomology and Zoology, v. 45, n. 1., p. 7-12, 2010. HEARD, T. A. 1999. The role of stingless bees in crop pollination. Annual Review of Entomology, v. 44, p. 183-206. 1999. IMPERATRIZ-FONSECA. V.L. ;DE JONG, D. & SARAIVA. 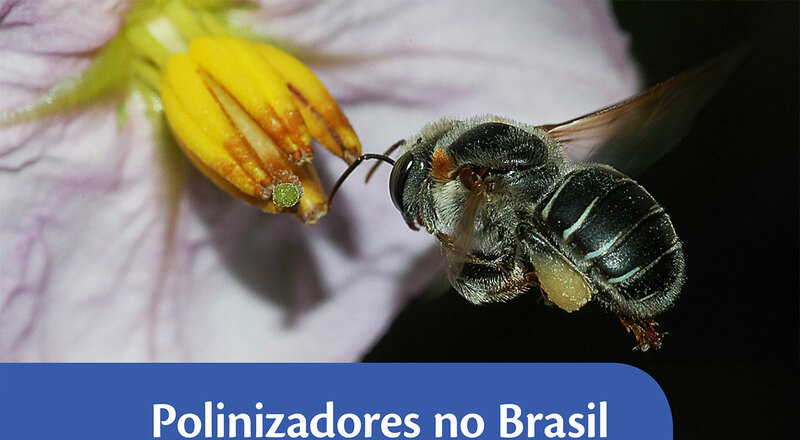 A.M.- Bees as Pollinators in Brazil: assessing the status and suggesting the best practices.Holos Ed., Ribeirão Preto, 114p. 2006. KLEIN, A. M.; VAISSIERE, B. E.; CANE, J. H.; STEFFAN-DEWENTER, I.; CUNNINGHAM, S. A.; KREMEN, C.; TSCHARNTKE, T. Importance of pollinators in changing landscapes for world crops. Proceedings of the Royal Society B-Biological Sciences, v. 274, n. 1608, p. 303-313, 2007. Larigauderie, a. & Mooney, H. A. The Intergovernmental science-policy Platform on Biodiversity and Ecosystem Services: moving a step closer to an IPCC-like mechanism for biodiversity. Current Opinion in Environmental Sustainability, v. 2, p. 9-14, 2010. LOZIER, J. D.; CAMERON, S. A. Comparative genetic analyses of historical and contemporary collections highlight contrasting demographic histories for the bumble bees Bombus pensylvanicus and B. impatiens in Illinois. Molecular Ecology, v. 18, n. 9, p. 1875-1886, 2009. MCGREGOR, S. E. Insect Pollination of Cultivated Crop Plants. Washington: U.S. Department of Agriculture, Agricultural Research Service, 1976. (U.S.D.A. Handbook 496). MORTON, D. C.; DEFRIES, R. S.; SHIMABUKURO, Y. E.; ANDERSON, L. O.; ARAI, E.; DEL BON ESPIRITO-SANTO, F.; FREITAS, R.; MORISETTE, J. Cropland expansion changes deforestation dynamics in the southern Brazilian Amazon. Proceedings of the National Academy of Sciences, v. 103, n. 39, p. 14637-14641, 2006. National Research Council (NRC). Status of Pollinators in North America. National Academy of Sciences, Washington, DC. 2006. OLLERTON, J.; WINFREE, R.; TARRANT, S. How many flowering plants are pollinated by animals? Oikos, v. 120, n. 3, p. 321-326, 2011. NUNES-SILVA, P; HNRCIR, M. & IMPERATRIZ-FONSECA. VL. A polinização por vibração. OecologiaAustralis, v.14, n.1, p. 140-151. 2010. PETTIS, J.; DELAPLANE, K. Coordinated responses to honey bee decline in the USA. Apidologie, v. 41, n. 3, p. 256-263, 2010. RATNIEKS, F. L. W.; CARRECK, N. L. Clarity on honey bee collapse? Science, v. 327, n. 5962, p. 152, 2010. RICKETTS, T. H.et al. Landscape effects on crop pollination services: are there general patterns? Ecology Letters, v. 11, n. 5, p. 499-515, 2008. RÖCKSTROM, J., STEFFEN, W., NOONE, K., PERSSON, Å., CHAPIN, F.S., LAMBIN, E.F., LENTON, T.M., SCHEFFER, M., FOLKE, C., SCHELLNHUBER, H.J., NYKVIST, B., WIT, C.A., HUGHES, T., VAN DER LEEUW, S., RODHE, H., SÖRLIN, S., SNYDER, P.K., COSTANZA, R., SVEDIN, U., FALKENMARK, M., KARLBERG, L., CORELL, R.W., FABRY, V.J., HANSEN, J., WALKER, B., LIVERMAN, D., RICHARDSON, L. CRUTZEN, P. & FOLEY, J.A. A safe operating space for humanity. Nature v.461, p. 472-475, 2009. SARAIVA, A. M.; ACOSTA, A. L.; GIANNINI, T. C.; IMPERATIZ-FONSECA, V. L.; MARCO JR., P. Bombus terrestris na América do Sul: Possíveis rotas de invasão deste polinizador exótico até o Brasil. Revista Estudos Avançados, 2011. SLAA, J. E; SANCHEZ CHAVES, L. A.; MALAGODI-BRAGA, K.S.;HOFSTEDE,F. E.. Stingless bees in applied pollination: practive and perspepctives. Apidologie, v. 37, n. 2, p. 293-315, 2006. Van Engelsdorp D., Evans J.D., Saegerman C., Mullin C., Haubtuge E., Nguyen B.K., Frazier M., Cox-Foster D., Chen Y., Underwood R., Tarpy D.R., Pettis J.S. Colony Collapse Disorder: a descriptive study, PLoS One 4, e6481.2009. VAN ENGELSDORP, D.; HAYES JR, J.; UNDERWOOD, R. M.; PETTIS, J. S. A survey of honey bee colony losses in the United States, fall 2008 to spring 2009. Journal of Apicultural Research, v. 49, p. 7-14, 2010. Van Engelsdorp D., Meixner, M.D. A historical review of managed honeybee populations in Europe and the United States and the factors that may affect them. J. of Invertebrate Pathology v.103, p. S80-S95. 2010. VAUGHAN, M.; SKINNER, M. Using Farm Bill programs for pollinator conservation. San Francisco: NRCS / The Xerces Society / San Francisco State University, 2008.